Adelaide & Rothera Stations (WAP GBR-13 & WAP GBR-12) – W.A.P. It was not until the British Graham Land Expedition of 1934–37 that Adelaide was confirmed to be an island separate from the Antarctic Peninsula. The Research Base at Adelaide Island referred to as Adelaide Base “T” (WAP- GBR-13) from July 1962, was established on 3 February 1961 on the South-West tip of the island. This was in preference to Rothera Point as it had a better skyway for aircraft and less sea ice to hinder access by ship. It was closed when the skyway deteriorated and operations were transferred to Rothera Station. Taken middle to late April 1976, showing the change from the summer weather to the winter,rain to snow and winds. Note the steps up to the front door of the base in the rain and then the snow steps up out of the base after the snow and blizzard.This was the last winter at Adelaide base before moving round to. Rothera Station (Station “R”), 67° 34′ South, 68° 08′ West, (WAP GBR-12) known as Rothera Point until 15 August 1977, was established in 1975 to replace Adelaide, where the glacier ski-way had deteriorated rendering the operation of ski-equipped aircraft hazardous. 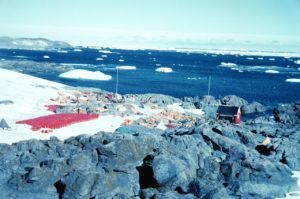 A party did camp at Rothera Point in the 1975/76 austral summer to open up the air facility. There was a phased construction programme so that by 1980 the station provided accommodation, electrical power generation, vehicle workshops, scientific offices and a store for travel equipment.